Despite the shutdown of the US government and the anxiety it brings to investors/traders we have indications of an upward movement for the major US stock indices. The three last candlesticks of the daily chart of S&P 500 (below) are forming a morning star bullish reversal pattern. 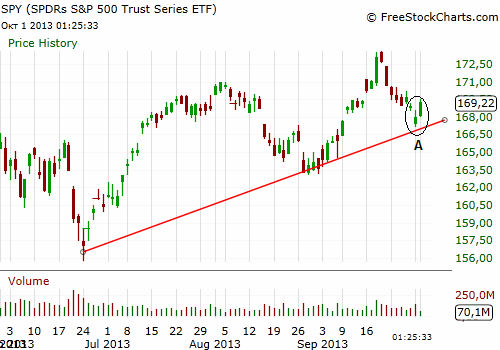 This is happening on an up slopping trendline (point A). The two facts together augment the possibility of an upward movement in the US stock market.